Scota, in Irish mythology, Scottish mythology and pseudohistory, was an Egyptian princess to whom the Gaels traced their ancestry, explaining the name Scoti, applied by the Romans to Irish raiders, and later to the Irish invaders of Argyll and Caledonia which became known as Scotland. According to the early Irish chronicle Lebor Gabála Érenn she was the daughter of Pharaoh Necho II of Egypt. She married Nel, son of Fenius Farsaid, a Babylonian who travelled to Scythia after the collapse of the Tower of Babel. Nel was a scholar of languages, and was invited by the pharaoh to Egypt and given Scota's hand in marriage. They had a son, Goídel Glas, the eponymous ancestor of the Gaels, who created the Gaelic language by combining the best features of the 72 languages then in existence. Goídel (or his son Sru) was expelled from Egypt shortly after the Exodus of the Israelites by a pharaoh whom 17th century Irish chronicler Geoffrey Keating names Intuir. After much travelling his descendants settled in Hispania (or Iberia - modern Spain and Portugal), where Míl Espáine was born, and it was the sons of Míl, Eber Finn and Eremon, who established the Gaelic presence in Ireland. According to Seumas MacManus in his book The Story of the Irish Race, Scota married Niul, but he was the grandson of Gaodhal Glas. Then another Scota, who was coincidentally also a daughter of an Egyptian Pharaoh, married Miled (or Milesius). 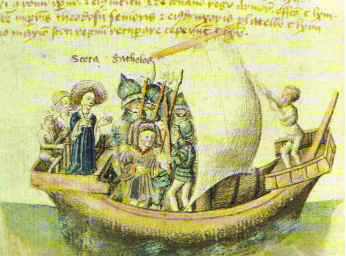 This second Scota left Iberia with her eight sons and their families, after Miled died, and headed for Ireland. Many of the sons died en route, due to a storm, and Queen Scota died during the battle between the Milesians and the De Danann. Other sources say that Scota was the daughter of Pharaoh Neferhotep I of Egypt and his wife Senebsen, and was the wife of Míl and the mother of Eber and Eremon. Míl had given Neferhotep military aid against ancient Ethiopia and was given Scota in marriage as a reward for his services. Writing in 1571, Edmund Campion named the pharaoh Amenophis; Keating named him Cincris or Forann. Many other sources say that Niul son of Fenius Farsaid, married Scota the daughter of the Pharaoh Cinqueris. They had a son Goidel Glas. Milesius a descendant of Goidel Glas married Scota Tephi, a daughter of the Pharaoh Nectonibus or Nectanebus.